If you haven't seen this yet, you must watch part one and part two (well, part three) of this amazing story. A Brooklyn man (Todd Bieber) found a lost roll of film in 2010, developed the photos, and then vowed to find their owner. His search ultimately led him to a European adventure and a reunion with the photographer in Paris. 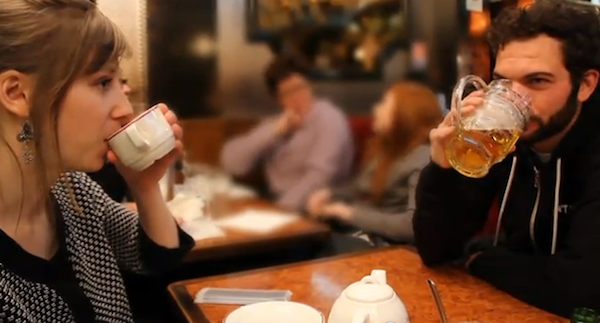 "We sat and drank tea and awkwardly talked," Todd says in the video. "I threw her in this situation and posted photos of her family that ended up all over the internet." She joked with him that her family had started calling him the "boy Amelie," after the character in the French movie who decides to change the lives of strangers around her. You've just gotta see this. This made me so happy today. I want to have an adventure like that. Whoa !!! Definitely better than the movies !! Completely loved it. Man, I wish I could have been a part of this journey. I love that he left all of his film for someone to find. I hope, hope, hope that someone doesn't take it and just become lazy with it. omg. that is amazing. my heart is so happy right now. Wow!! That is f*ing cool! What a fantastic story! It warms my heart to know there are people like everyone in those videos in the world. :) Adventure is just around the corner! What an amazing story! I hope that someone finds and develops the film that was left but I have a feeling (a sort of melancholy one) that magic this potent only happens once. I hope that I remember this the next time I wonder "what if" so that I take action instead of just wondering what could happen and leaving it at that.